Rankin Beach and Rankin’s old Yates Hotel. Rankin Museum Association President Donna Bell has spent much of her life on a ranch and is not afraid of hard work. When money became available to repaint the lobby of Rankin’s old Yates Hotel, now the town’s museum, she pitched in and helped prep the plaster walls for a color makeover. But she encountered a stubborn raised spot next to the stairs that she couldn’t budge no matter how hard she tried. Finally, she gave up and just painted over it. Later, from one of the sons of hotel-builder Ira Yates, the legendary father of the old rich Yates Field, she learned the story behind that rough place in the wall. It marked a rough time in Rankin’s history, when bootleg booze and black gold flowed with equal ease. Yates built the three-story, 46-room sandy brick hotel in 1927 at the height of the oil boom that exploded on the Pecos County ranch he had traded a general store for in 1915. In considering a name for his new hostelry, he modestly thought Yates Hotel had a nice ring to it. Billed as the first fire-proof hotel between Fort Worth and El Paso, the Yates had a restaurant, drug store and barbershop. The hotel saw many a hand-shake deal during the boom years and became a popular stopping place for east-west travelers. The rooms on the north side had no closets and cost less than the south-side rooms, which caught a better breeze and had a door between rooms so they could be used as suites. North or south-side, however, guests had to walk down the hall to a bathroom. By today’s standards, a room on either side of the hotel did not cost all that much. A single school teacher who lived there in the late 1930s paid $39 a month for a room – meals included. 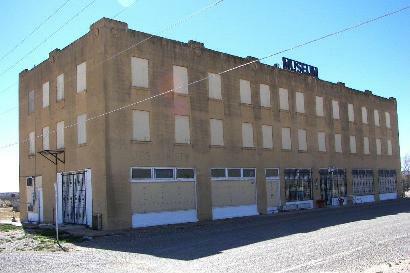 The hotel closed in 1964 and stood vacant for a decade before the Rankin Museum Association converted it into a museum. Though someone vandalized the hotel about a year after it went out of business, the Yates’ original wicker furniture still sits in the lobby with its restored black and white checkerboard floor. During the Yates’ heyday, within an easy walk from the hotel lay one of the marvels of West Texas: Rankin Beach. That part of the state had not had any waterfront access since prehistoric times, but Yates put in a giant concrete swimming hole, 60 feet wide and 120 feet long. Legend has it that he even had beach sand trucked in from the Texas coast, though he could have gotten plenty from the sand dunes of not-too-distant Ward County. People could keep cool in Yates’ pool, enjoy live entertainment at the adjoining dance pavilion or spin around on a skating rink. A young accordion player named Lawrence Welk and his orchestra played at Rankin Beach in 1928-29 as did Louis Armstrong and Jack Teagarden. One night during the boom, while her husband toiled away in the oil patch, his pretty wife sashayed and shimmied on the dance floor at the nearby Skidmore Plantation with an equally light-footed male partner. The evening seemed magic until the woman’s husband showed up and pulled a pistol from his oil-stained coveralls. Seeking any port in a storm, the woman and her dancing partner hoofed it toward the Yates Hotel, the armed husband close behind. When they entered the hotel’s lobby, the bell hop ducked as the husband fired several shots at the man he’d caught dancing with his wife. None of the bullets took effect, and officers soon corralled the jealous husband, but the flying lead left some ugly pockmarks in the wall. For some reason, whoever repaired the bullet holes did not bother to smooth over the one next to the stair way. So far as is known, that was the only gunplay at the Yates. That may be why the hotel has a scarcity of ghosts. Almost all old hotels come furnished with at least one restless spirit, but Mrs. Bell says the Yates is no Hotel California. One woman claimed to have had encounters with a lady apparition she called Gertrude, but Mrs. Bell says she’s never heard or seen anything unusual at the Yates other than the old bullet hole. If anyone’s spirit is lingering at the Yates, by all rights it ought to be Yates himself. He spent a lot of time in his hotel prior to his death in 1939 and oil paintings of he and his wife are prominently displayed in the lobby. For a fellow who didn’t learn to read until he was 14, Yates obviously had a good head for business. Folks said he did well at cards, too. Knowing when to fold ‘em and when to hold ‘em sure paid off for the old man.